We imer Hall is considered one of the finest educational journalism buildings in the nation. 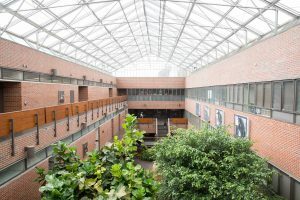 Named for Rae Weimer, the first dean of the College, the school moved into the $6.3 million building in 1980, and added the $3.1 million, Alvin G. Flanagan Telecommunication Wing in 1990. Additional media properties space was added in 2001 and the Innovation News Center was completed in 2012. In addition to 20 classrooms and laboratories, Weimer Hall houses the Innovation News Center, four radio stations, two television stations, research facilities, a 250-seat auditorium and 11 satellite ground stations. As an acknowledged leader in communication technology, the College has put forth a set of computer requirements requiring that each student have access to a personal computer. In support, the College provides some 300-networked computers equipped with the latest computer hardware and software packages. Weimer’s well-equipped laboratories and classrooms also provide experience with professional-quality equipment, including television and radio production hardware, reporting and editing terminals, digital still cameras, and computerized graphics equipment. The College’s Division of Multimedia Properties, located in the Flanagan Wing of Weimer Hall, includes seven broadcast stations, allowing students from throughout the College to gain experience in a competitive broadcast marketplace. More than 300 students work in news, sports, production, management positions, web design, promotions and advertising for the radio and television stations each semester. Public broadcasting television station WUFT-TV/DT carries PBS and locally produced programming, including a daily newscast produced by the College’s students. Commercial television station WRUF-TV broadcasts local weather, news and sports and serves as a training ground for budding meteorologists. Commercial radio station ESPN 850 AM/95.3 FM (WRUF-AM) is the top sports station in the market, while its FM counterpart Country 103.7 the Gator provides residents across North Central Florida with the market’s only contemporary country radio station. The National Public Radio affiliate, WUFT-FM 89.1, and its repeater station, WJUF-FM 90.1, provide news, talk and variety programming from NPR, PRI and APM along with local news, weather and a Spanish language newscast on Saturday mornings. WUFT Classic (89.1 HD2 and 102.7 FM in Gainesville) plays classical music 24/7 and 89.1 HD3 has a top-40 music format. In addition, the College has a partnership with the University of Florida Athletic Association to work with their professionals to produce high quality content for Florida Gator venue videos and online distribution. The Innovation News Center is the home of the College’s news, weather and sports operations. The two-story, 14,000-square-foot space replaced three 1980s-era newsrooms, and provides nearly 100 seats for reporters, producers and editors working together to report the news for the College’s many distribution channels, including WUFT-TV, WUFT-FM 89.1, ESPN 850/95.3 WRUF, Country 103.7 the Gator, WRUF-TV 6, wuft.org and other affiliated websites. 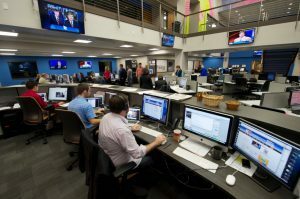 The facility, which opened in the fall of 2012, allows the College’s students to learn to report from multiple platforms. Using the ROPE model – report once, publish everywhere – students work in a real world environment that prepares them to produce content at any type of media organization. The INC is organized around a “super desk” where an assignment manager and news managers from web, television and radio are seated. Directly adjacent are seats for senior producers to manage the coverage on each platform. Three pods of nearly 24 seats each hold journalism and telecommunication students as they report and produce stories. Sprinkled through are breakout rooms for team meetings, television and radio editing rooms and audio booths. 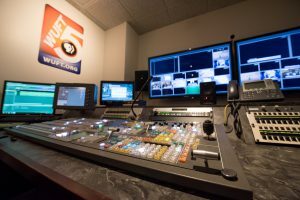 The space also includes a mini-studio (or “live-shot area”) where the College’s students create video content for streaming and for broadcast on WUFT-TV and WRUF-TV. 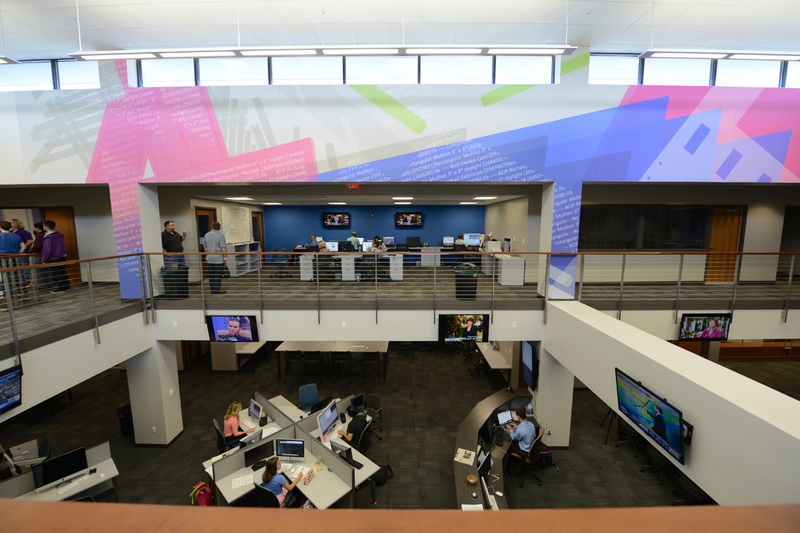 The second floor space includes a video editing laboratory, a conference room and newsroom space for the College’s and ESPN 850/95.3 WRUF sports operations and reporting. All of these spaces overlook the news floor and are connected by two open staircases and bathed in natural light from the clerestory window overhead. Led by professionals, staffed by students and inspired by faculty, The Agency is a team of seasoned professionals and hand-selected twenty-somethings with a passion for ideas that resonate with millennials. 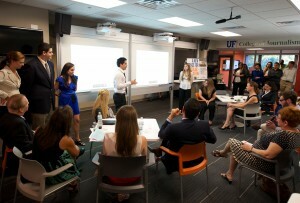 It is housed within the University of Florida’s College of Journalism and Communications. Built on a foundation of research, The Agency develops inspired and informed campaigns to build brand loyalty among this important segment of the population that will spend $10 trillion in their lifetimes. Located off the atrium on the ground floor, PATH is the place to go for academic advising, admissions and scholarship information and, through the Knight Division, career preparation and placement help. The Knight Division is also home to our multicultural affairs initiatives. The Media Effects and Technology Lab (METL) is a new state-of-the-art facility dedicated to investigating human-technology interactions across multiple platforms. The METL will serve as a collaborative space for interdisciplinary teams of faculty, students, and industry professionals to design, disseminate, and evaluate the effects media content, while also producing socially impactful insights. Projects currently under development investigate the future of advertising in virtual reality (VR), the impact of immersive journalism, and the influencing of pro-environmental attitudes and behaviors through customized digital experiences. Powered by the latest eye-tracking, facial expression, and physiological monitoring technology, the METL seeks to position UF at the forefront of communication research, nationally and globally. AHA!, which opened for students and faculty in March 2012, is primarily for students in public relations, advertising, public interest communications and telecommunication production. The Suite allows these students to hone their skills in digital technology and develop campaigns and programs across multiple media platforms. 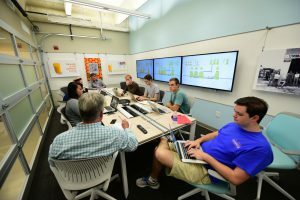 The Suite provides an area for students and faculty to explore emergent technologies and connectivity and provides a space for students from advertising and public relations to work more closely together. It consists of an open “Collaborative Café” surrounded by four high-tech breakout suites where teams of students work collaboratively to develop their ideas. The Allen H. Neuharth Reading Room is located on the 3rd floor of Library West and is a part of the University of Florida George A. Smathers Libraries system. The primary mission is to serve the instructional and research needs of the students, faculty and staff in the College of Journalism and Communications. The library provides reference materials, a circulating collection of books, scholarly journals, newsletters, professional/trade journals, newspapers, and popular magazines. Computer workstations are available to access the extensive databases and other resources. Reference and research assistance is also available. Neuharth founded USA Today in 1982 and retired from Gannett in 1989.